Guests are in for a delicious stay when they book a room at Chestnut Street Inn in Sheffield, Illinois. Not only can they savor complimentary snacks and delicious homemade breakfasts, but wonderful dinners too! Chestnut Street Inn is an historic 1854 home that exudes contemporary luxury, featuring four en suite guest rooms with amenities designed for comfort. There’s a delightful patio for warm-weather lounging and a patio with fireplace that makes wintry days warm and cozy. Owners and innkeepers Jeff and Monika Sudokov bring a wealth of talent and creativity, including backgrounds in theater (he a musical performer, she a ballet dancer). They’ve also traveled extensively and you’ll find items from their trips displayed throughout the Inn. But what really sets the Chestnut Street Inn apart is its food. Breakfast is a culinary treat with delectable dishes such as Veggie Frittata with Roasted Pepper Sauce or Crab Cake Eggs Benedict. 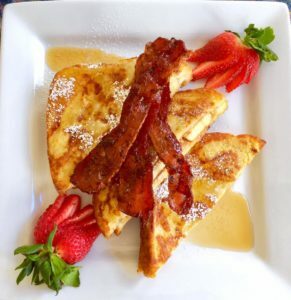 Another favorite, Elvis French toast with candied bacon, is the winner of the 2017 Best B&B Breakfast Tournament, an annual contest by BedandBreakfast.com. But the delicious food doesn’t stop at breakfast; the Inn also serves exquisite multi-course dinners to guests who wish it. Chef Monika—who has a Masters Degree in cultural anthropology and is a Certified Culinary Professional—draws on locally sourced and fresh ingredients to create nightly menus with a Mediterranean flavor. 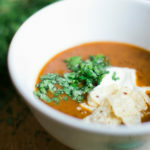 One recent dinner included tomato bisque; mixed greens with macadamia nuts, berries, and goat cheese; chicken with roasted pepper sauce; and poached pears in port and orange reduction with marscapone creme. Needless to say, guests go to bed happy! For those wishing to perfect their own culinary skills, the Chestnut Street Inn offers hands-on cooking classes by reservation, Sunday through Thursday. Classes are for one to six people last two to three hours. Cooking Classes, $60/person, plus tax. Includes instruction, recipes, and full meal following the class. Chestnut Street Inn is a member of the Illinois Bed and Breakfast Association … a unique lodging experience! This entry was posted in Food and wine, Illinois Bed and Breakfasts and tagged Dining, Illinois Bed & Breakfasts by admin. Bookmark the permalink.